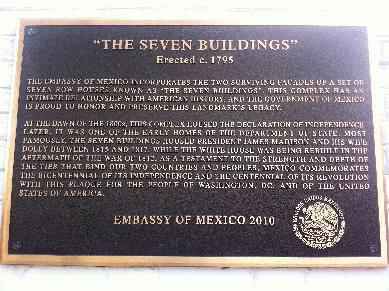 The Embassy of Mexico incorporates the two surviving facades of a set of seven row houses known as "The Seven Buildings". This complex has an intimate relationship with American history, and the Government of Mexico is proud to honor and preserve this landmark's legacy. At the dawn of the 1800's this complex housed the Declaration of Independence. 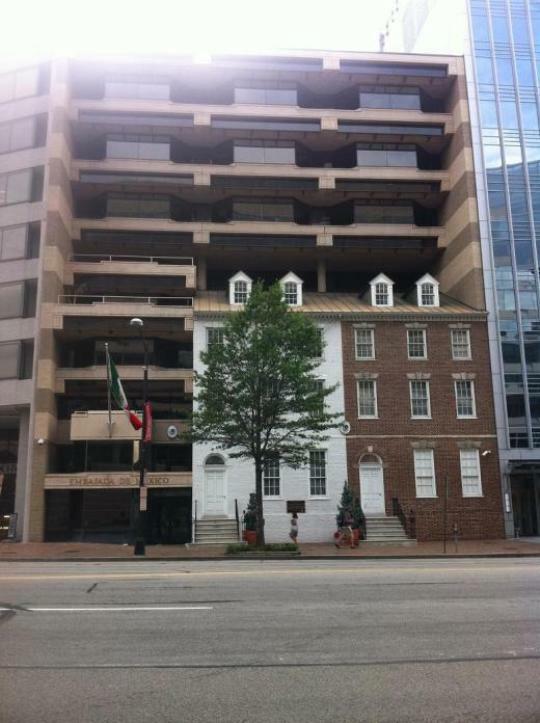 Later, it was one of the early homes of the Department of State. Most famously, the Seven Buildings housed President James Madison and his wife Dolly between 1815 and 1817, while the White House was being rebuilt in the aftermath of the war of 1812. As a testament to the strength and depth of the ties that bind our two countries and peoples, Mexico commemorates the bicentennial of its independence and the centennial of its revolution with this plaque for the people of Washington DC. and of the United States Of America. It is interesting to note the mis-spelling of First Lady Madison's name - Dolly - on the plaque. It was actually Dolley. Not that we are experts but the source of that assertion WhiteHouse.gov can, we feel fairly confident, be relied on for accuracy as to most facts Presidential. At first glance, one would think it was just a facade. Upon closer look, it is actually an infrastructure nestled within the old building. Awesome!